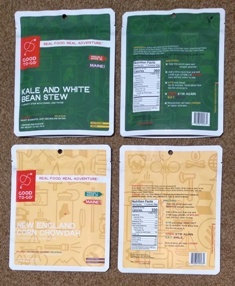 The Good To-Go New England Corn Chowdah and Kale and White Bean Stew are the two newest flavors available in these dehydrated gourmet trail meals. They are available in one or two-serving size packages and come in a heavy pouch suitable for adding boiling water and hydrating. The pouch top is also resealable. My initial impression was that the meals seem much like I'd expected based on the website. The packaging is typical Good To-Go with basic, easy-to-read font yet attractive pouches. I liked to see that these meals are all created by a genuine chef! Now that's sounding good for some palatable trail meals. I'm used to making my own meals using mainly freeze-dried ingredients and packaging them for two people in a freezer zip-top bag. With those meals as my baseline, I found the Good To-Go meals to be a little heavier and bulkier especially since they are for one serving. I think the added weight is mainly due to the heavier pouch used for rehydrating and the mainly dehydrated (heavier than freeze-dried) ingredients. Next I read the descriptions, ingredients and nutrition facts and it all made my mouth water! I can't wait to try these out. Even in summer, some of our favorite trail meals are soups and stews. 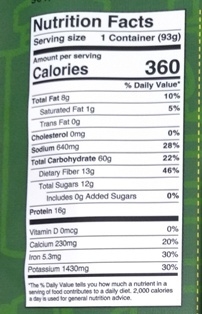 I love that the ingredients are all identifiable and healthy. The Chowdah has bonito (fish) in it making it pescatarian and the Stew is vegan. I eat everything but it's nice to see that Good To-Go offers a variety of meals for many types of special diets. The instructions are pretty straight-forward and include adding a specific amount of boiling water, just over and just under 1-1/2 c (355 ml) in the cases of the Stew and Chowdah. I was happy to see a 'vaguely approximate fill line' also noted on the side of the package. I plan to try cooking both measured and estimated to see if the approximate line would keep me from having to carry a measuring cup. For soup and stew, I expect that it won't matter much to have a little too much or too little water. The 15 minute rehydration time is noted to be longer at elevation. I'm curious how much longer it will take since 15 minutes seems a little long as compared to my own prepared meals. Again I presume that these meals may use all dehydrated ingredients rather than freeze-dried so that may explain the longer times. I find that my own dried ingredients take a lot longer to rehydrate on the trail than freeze-dried ingredients. Directions included on the back of each pouch say to open the pouch, remove the desiccant, add 1-1/2 cups (350 ml) of boiling water, stir, reseal and wait 15 minutes before opening, stirring again and eating. They even note to think about how big the universe is while waiting. Hah, I love companies with a sense of humor. There is a note that rehydration will take longer at higher altitudes so I'll be interested to see how much affect elevation has. 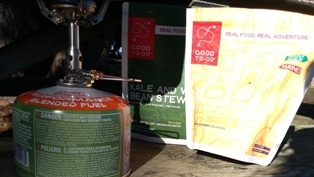 The Good To-Go New England Corn Chowdah and Kale and White Bean Stew are two new offerings just in time for cooler weather. How well will they rehydrate? Do they taste as good as they sound? How well will they pack into my bear canister or backpack? I ate the Good To-Go Meals on two different trips with varied elevation and weather conditions. One was nearly at sea level on the Northern California Mendocino Coast where I hiked on two different days. The other was on two snowshoe hikes in the Sierra Nevada at mountainous elevation where I had them for lunch each day. Just in advance of my first trip, I poured out the contents of one of each variety at home to get a photo of what the dry ingredients look like. I also measured them and both the Stew and Chowdah were 3/4 cup (255 g) each. Both meals looked hearty with chunks of ingredients readily seen along with what seems to be a good amount of seasoning. The Chowdah had a distinct fishy smell that was noticeable but not disagreeable. As I mentioned previously, I prepare most of my own backpacking meals and my rule-of-thumb recipe calls for 1/4 cup (85 g) meat, 1/2 cup (170 g) veggies and 3/4 cup (255 g) carb (rice, noodles, etc.) for each serving of a dinner meal. 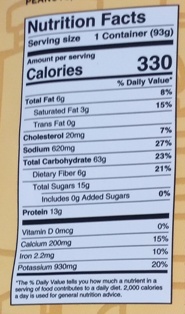 That puts the Good To-Go meals at about half of my normal serving size so I found that to be a little bit surprising. I'll plan to bring additional food with me to complete my meal. I should clarify that I like a larger meal at mid-day and a smaller meal in the evening both on the trail and off. I then poured them back into their respective pouches with their desiccant and easily zipped up the zip-top for packing on my trip. I was able to squeeze out most of the air and the zip-top felt solid and secure. I noticed that while the Stew and Chowdah arrived together, the Stew has exactly one additional year of expiration date. The Stew has a Best By date of 10/9/2020 while the Chowdah has a Best By date of 10/9/2019. I'm assuming that the difference is due to the fish included in the Chowdah. I typically carry a weekender size of bear canister when hiking in bear-frequented areas and found that the Good To-Go packaging fit easily into my canisters and flatten nicely for easy stacking in my pack too. On the first trip to the coast, I prepared the soups according to the instructions using a measured amount of water. I noted that the 'approximate fill line' on the side of the pouch was very accurate too so I would be comfortable just using the fill line in the future. The exact quantity of water for a soup or stew isn't that critical to me. First I prepared the New England Corn Chowdah by first removing the desiccant from the pouch. Don't forget! I boiled the water to a rolling boil and then added it to the pouch giving it a good stir and then closing it up for 15 minutes. I didn't use a cozy for maintaining the heat just to see how it would do. After a timed 15-minute wait, I opened the pouch, gave it another stir and tried a taste. It was still fairly warm but not hot. The smell was pleasing with a slight aroma of fish. 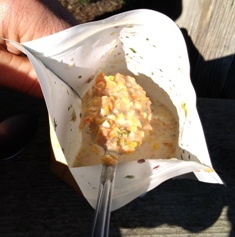 The consistency had thickened significantly since closing up the pouch and was now a nice medium-thick chowder. The taste was very good reminding me of a more gourmet version rather than a basic chowder recipe. I really liked that! The texture was nice in my mouth and tasted hearty. There was one ingredient that was still crunchy, not in a bad way, but more like tiny pieces of uncooked carrot. I attributed this to the sweet potato which hadn't completely hydrated. It didn't take away from my enjoyment of the chowder though. On the next hike, I prepared the Kale and White Bean Stew in the same manner as the Chowdah above. The directions called for more water than the Chowdah but otherwise it was all the same. 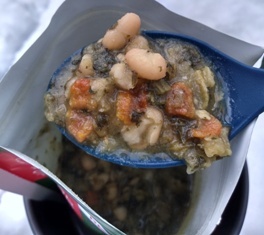 This time when I opened the pouch, the stew seemed hotter than the chowder had which was more palatable to me. It also stayed warm through the entire meal where the chowder had cooled a little too much for me by the end. Like with the chowder, the consistency which was VERY watery upon closing the pouch had thickened to a nice medium-thick stew. The smell and taste again had more of a gourmet flair than a basic stew and was very tasty. Because the stew is vegetarian, I wasn't expecting the stew to be very hearty or filling, but it was definitely both! The taste was completely in contrast to the chowder with nothing about the stew reminding me of the chowder. I liked that because trail meals can seem too alike and make for a boring rotation. This time I didn't find any bits that were still crunchy. The beans were hydrated and becoming creamy. I ate each of the meals with a piece of sourdough bread which provided a hearty and filling lunch. They were easy to digest for more hiking right after lunch and gave me energy without feeling stuffed. The zip-top pouches have a very secure zipper which worked well for carrying out trash. 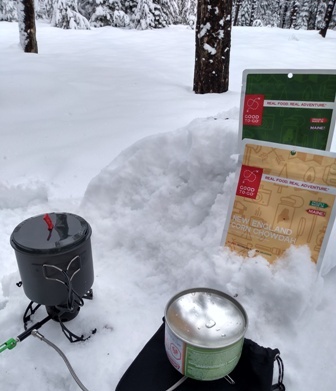 On the second trip, I prepared the meals for lunch while snowshoeing on two different hikes. This time I simply used the approximate fill line on the pouch for measuring the water. This was much easier and they turned out very similarly to the other trip when I measured the water. Even though the conditions were MUCH colder on this trip, the Chowdah turned out even better than before. It didn't cool so quickly this time despite the cold weather. Again, I didn't use a cozy for hydrating but the meals were still hot after the 15-minute hydration time. I ate the stew with a small wrap sandwich on one day and the chowder with a small slice of pizza on the other day. The Chowdah is slightly sweet probably due to the corn and sweet potato being the main ingredients. There were some crunchy bits in the Chowdah like last time which don't pose a problem for me but I'm normally happy with my veggies being cooked al dente. I may tend to like the bean stew best but the flavors are so different that I can't really favor one over the other. I liken it to my two favorite fruits, cherries and peaches. They are both fruit and both fantastic but I wouldn't be able to pick a winner. Overall, the Good To-Go meals were excellent in my opinion. I loved the contrast between the two varieties and the heartiness and taste of both. This concludes my Long-Term Test Report and this test series. 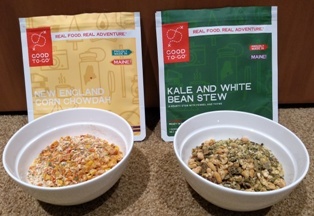 Thanks to BackpackGearTest.org and Good To-Go for the opportunity to try out these yummy meals.